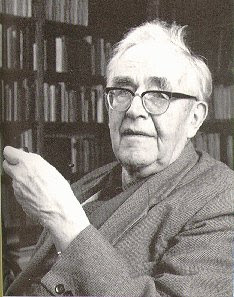 “Dogmatics has no more exalted and profound word – essentially, it has no other word – than this: that God was in Christ reconciling the world unto himself.” If you want to know what Karl Barth’s Church Dogmatics is all about, then the whole 9,000-page work is summed up in that single sentence. The digitisation has also created many excellent additional features. Particularly valuable is the ability to mark up the text and to create your own annotations – this feature will be a great help both to general readers and to scholars doing close work on the CD. Further, the digital text integrates with all other Libronix resources (Logos kindly sent me a complimentary copy of the Scholar’s Gold Library, so I’ve been using this as a base library), and this produces a whole range of wonderful features. For example, the CD is instantly linked to any Bible version of your choice. 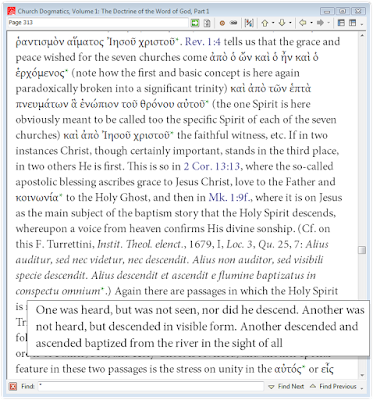 I’ve made the RSV my default Bible, so that any time I come across a biblical reference in Barth’s text, I can just hover over the reference and the full passage appears as an RSV pop-up (or, if you prefer, you can use a Greek edition such as the Nestle-Aland). 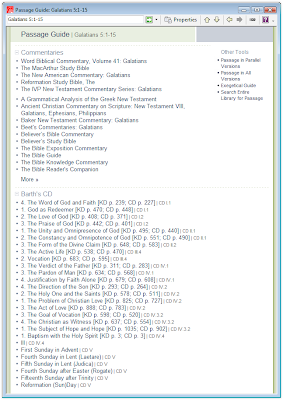 This system of biblical referencing is also integrated with all commentaries in your Libronix library. So if I want to analyse Barth’s exegesis of 1 Corinthians 15 in his doctrine of reconciliation (CD IV), I can easily move back and forth between Barth’s text, a critical edition of the NT text, and various commentaries (such as Bruce Metzger’s Textual Commentary on the Greek New Testament and Anthony Thiselton’s massive NIGTC commentary on 1 Corinthians). And if I’m puzzling over a particular Pauline term in Barth’s exegesis, I can also jump to exegetical resources such as Kittel’s TDNT or the Exegetical Dictionary of the New Testament). I only wish I’d been able to do all this when I was writing my recent AAR/SBL paper on Barth’s exegesis of Paul! In any case, I’m convinced that Barth’s theological exegesis is one of the most fruitful avenues for future research on the Church Dogmatics – so the integration of this digital edition with so many biblical and exegetical resources should be a major boon to such research. The text is seamlessly integrated with many other resources as well. Double-clicking any word executes a keylink to your other Libronix resources. For example, if Barth mentions an obscure topic like “J. G. Herder” or “supralapsarianism”, I can just double-click the word in order to find the related entries in a reference work such as The Encyclopedia of Christianity. For this keylinking, you can set up and prioritise which resources to use for the various data types (e.g. English, Greek, Hebrew, Latin, etc.). Further, many major historical texts are linked directly to Barth’s text – so whenever Barth cites the Apostolic Fathers, or Augustine’s Confessions, or Calvin’s Institutes, or Kittel’s TDNT, or various creeds and confessions, the citation links directly to the relevant passage in those texts. For instance, when Barth cites Calvin’s Institutes, you can directly move back and forth between Barth and the passage in the Institutes. And if you’re doing a close study of Barth’s interpretation of Calvin, you can do all sorts of advanced searches as well – you could, for example, find every place where Barth refers to a specific book or chapter of the Institutes (as illustrated here). And of course the whole text of the CD is searchable as well – so if you want to locate every time Barth uses a certain word or phrase (e.g. “Bultmann” or “fundamentalists” or “imago Dei”) or biblical passage (e.g. John 1:14 or Genesis 1:1-2:4), then the digital search function provides a much more efficient, more flexible and more reliable resource than the old index volume. You can search for any word – a quick search of “reprobation” instantly gets you 69 hits (based on the root); or you can search for any phrase – “in Christ” brings up 725 hits. You could also quickly search Barth to find all the places where he mentions a certain reference in the Apostolic Fathers or Calvin or TDNT, etc. This kind of very specific information would be nearly impossible to find any other way. You can also search other portions of your digital library for references to the CD. I’ve often thought about writing something on Cornelius Van Til’s interpretation of Barth. If I’ve got Van Til’s works in my Libronix collection, then I can search for every time he refers to Barth’s CD (over 6,000 references). Since the digitisation recognises the pagination of Barth’s German, this search function works equally for references to Barth’s German or English edition. And this function will be constantly evolving as well, since new Logos books which cite Barth will also be linked to the CD. (Oops, it looks as though John MacArthur has turned up in the results as well – but I can easily omit him from my future searches.) 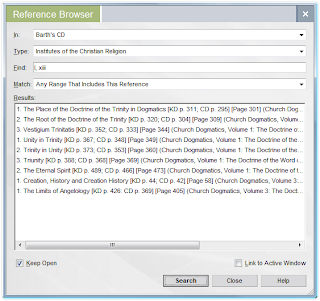 In the same way, I can use the CD as a basic reference work: if I’m doing a search on some church-historical topic, then Barth’s discussions of that topic can be displayed alongside reference works like the 3-volume The Encyclopedia of Christianity. In sum, this is a wonderfully rich and delightfully user-friendly resource both for general theological readers and for students of Barth. The new digital edition will certainly be a tremendous help in my own future research! With its accessible format, enhanced search capabilities and seamless integration with so many other texts, it will no doubt establish itself as an indispensable resource for the next generation of Barth scholars, and for the wider community of pastors, theologians and students. If you’re thinking of getting a copy, don’t forget that the reduced pre-publication price will be available until 20 April. And thanks to the kind folk at Logos, if you’re interested in picking up one of their base libraries, you can also get a 25% discount by visiting this page, or by entering the coupon code FAITH-THEOLOGY.